Love crossing things off your to-do list? Set achievable goals to reach that feeling of satisfaction. A few days ago, I polished off one more of my 2018 genealogy goals. And while I was working through that task, I realized something very important. Setting goals for yourself that are entirely possible will make you feel so much better at the end of the year. 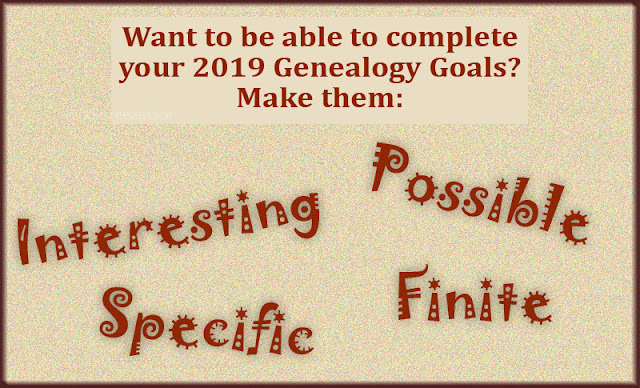 Set your 2019 genealogy goals with purpose for a better result. Break big, time-intensive tasks into achievable chunks. Don't put all those chunks on the list. One of my 2018 genealogy goals was "Log Antenati documents into spreadsheet". My "Antenati documents" are thousands and thousands of Italian vital records. I want to enter all the facts from these documents into an Excel spreadsheet. The spreadsheet will make the entire collection easily searchable and shareable. I can't possibly reach this goal in a year. In fact, the sheer size of the project tended to keep me away from it. This project is still important to me, though. So, in 2019 I need to make it more achievable. I can break it up into achievable chunks. 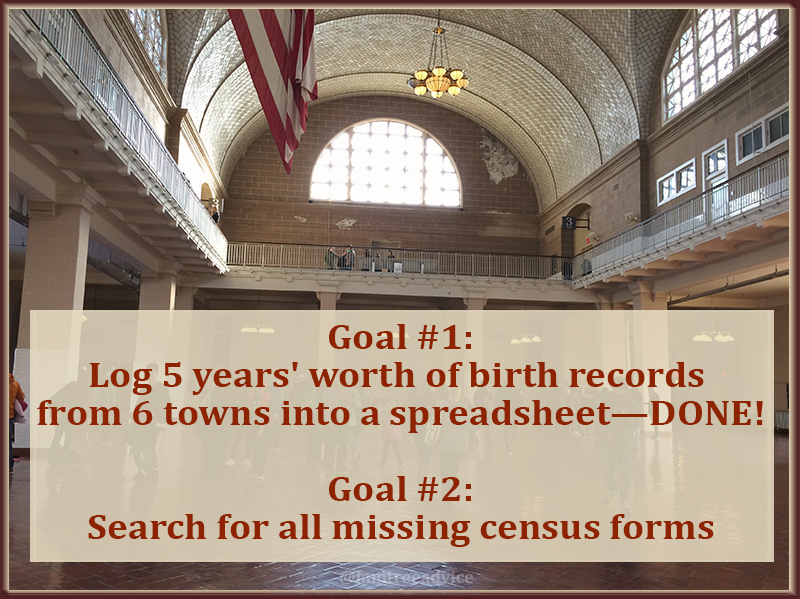 Goal #1: Log the first five years' worth of birth records from each town into spreadsheet. When I finish that goal, I may move on to the first five years' worth of death records from each town. Another of my 2018 genealogy goals was "Find my parents' connection". I discovered from a DNA test that my parents are 3rd or 4th cousins. I basically asked myself to find a needle in a haystack within a certain amount of time. If your goal involves a ton of research that may lead nowhere, change your expectations. I made a breakthrough on this front in November. (See "The Leeds Method May Have Solved a Big Family Puzzle".) Evidence tells me to look at the last name Pozzuto in the town of Colle Sannita. So far I've added babies born between 1809 and 1820 and between 1858 and 1860. Sometimes I went further. I found the baby's parents' marriage documents. I've built out some unrelated families to the point where they became related to me. One of these families will hold the key. But I don't know when I'll find that connection, so I have to change my expectations. Goal #2: Enter every Pozzuto baby from Colle Sannita into my family tree. That first one contains two completely different goals (bad idea). They both involve finding out the truth about the flimsiest of rumors. I have done a few newspaper searches, but honestly? I don't have enough information to go on. Rumor #1 says that my great grandfather and his brothers-in-law moved away from their railroad jobs in New York because of an accident. One of their sons was playing in the railyard without permission. He had an accident and lost some toes. Goal #3: Find a resource for Erie Railroad documents during the years my great grandfather worked in New York state. Rumor #2 is even flimsier. It says my other great grandfather's brother Agostino had to leave the Bronx and flee to Illinois. He either witnessed or took part in a fight that may have left one man dead. Goal #4: Gather every available document of Agostino's time spent in the Bronx to figure out the year he moved to Illinois. The second vague goal involves a ribbon pinned to the chest of my great great grandfather in his coffin. I learned that the ribbon is from a mutual aid society in which Italian immigrants helped out newer immigrants to America. But I haven't been able to find out any more than that. Goal #5: Search 1920–1925 New York City newspapers for any mention of the mutual aid society to which my great great grandfather belonged. The third vague goal is about my great great grandmother Maria Luigia's last name of Muollo. A Muollo family from her town came to settle in Burgettstown, Pennsylvania, with Maria Luigia's nephew. I want to find the exact relationship between him and my great great grandmother. 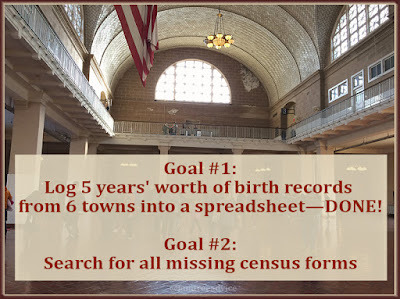 A specific approach to this goal would be to log all the Muollo babies and gather all the documents for the Muollo who came to America. I'll see where that gets me. 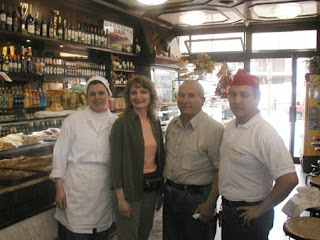 Goal #6: Log every Muollo baby born in Sant'Angelo a Cupolo into my family tree, and find all available documents for the one who emigrated to Pennsylvania. I've listed six genealogy goals for myself in this article. But I'm not sure I'll put them all on my list. I want to keep it interesting, challenging and fun so that I'll do it. Goals #1 and 2 above are definitely going on the list. I'm deeply involved in these now, and I want to see them through. Goal #6 above is also interesting to me, and I don't think it'll take a lot of time. But I want to keep thinking about this. I want to add a goal or two that will teach me more about genealogy, or get me excited each time I sit down to work on them. Set yourself up for success and you'll be eager to work toward completing each goal. Happy 2019! How Many of These 5 Gifts Does Genealogy Research Give You? Do people have a hard time understanding your interest in genealogy? They don't realize all the gifts it gives you. We get into genealogy for different reasons and with different expectations. I met a man who thought after 3 clicks on an unsourced genealogy website that he was related to Adam and Eve. That's it. I win genealogy. Others are eager to learn about where their ancestors came from. What was their family name before their grandfather changed it? Can they find living cousins they never knew before? Why did their ancestors leave their homeland? Our motivations can change over time, too. I've learned from my research that all my ancestors came from a compact geographical area—my mom's side and my dad's side. Then DNA testing showed me my parents are not-too-distant cousins. That's an important motivation for me now. My genealogy research gives me an appreciation for my lost culture. Give the following genealogy research gifts some thought. Then, get ready to fire back some knowledge at the next person who says you're wasting time on your family tree. 1. My genealogy research gives me an appreciation for my lost culture. As the grandchild of immigrants, I was raised in a much different culture than my ancestors. Most immigrants to America tried their best to assimilate and blend in. Their cultural influence diminishes with each new generation. 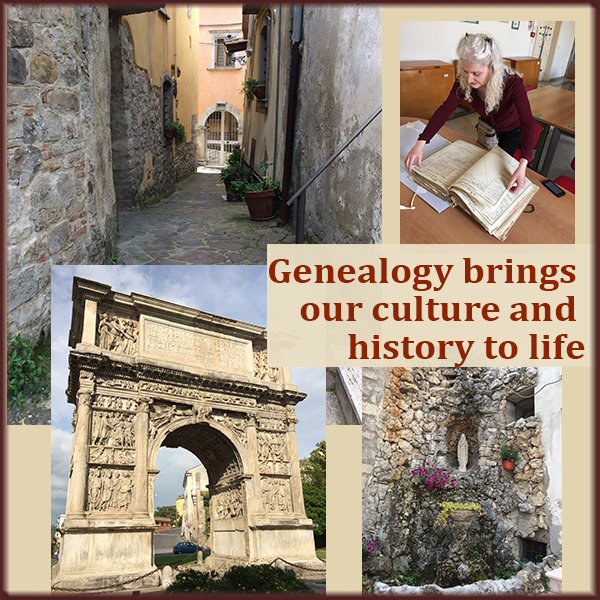 Your genealogy research teaches you about the names, places and customs of the old country. It makes you wish your ancestors were still here to tell you all about it. 2. My genealogy research inspires me to visit to my true homeland. 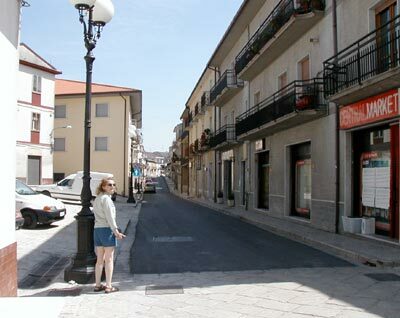 The first time I set foot in my grandfather's hometown in Italy, the earth moved. I felt a sense of belonging. I loved everything I saw. Every stone, garden and poppy. After that visit I spent time studying the language and preparing for my next visit. I've been there a few times, and going back is all I can think about. 3. My genealogy research urges me to learn more about history. My maternal grandfather was a prisoner of war in Italy during World War I. As a prisoner, he had to eat rats to stay alive. But he never told us anything more. I researched Italian army battles where prisoners were taken. I narrowed down my search to a particular battle where an astonishing number of prisoners were captured and sent to one of two camps. That was my theory of what happened to my grandfather. During my last visit to Italy, I went to the archives to see my grandfather's military record. Imagine my tears when I saw for myself that he really was in the battle I had guessed. And they sent him to one of those two prison camps. We each have our own reasons for taking up this hobby. 4. My genealogy research has made me more analytical. Newcomers to this hobby haven't yet seen how easily you can follow the wrong lead. How quickly you can put the wrong family into your family tree. These mistakes can still happen to us after years of research. But with each mistake, we learn what to look for, and what to look out for. We become more analytical and keep an open mind. Those skills will spill over into your everyday, non-genealogy life. 5. My genealogy research has made me more organized and efficient. As a contractor, I've always worked for more than one company at a time. I like to take the skills I learn on one job and apply them to the other. I get better at my job and both companies benefit. Everybody wins. 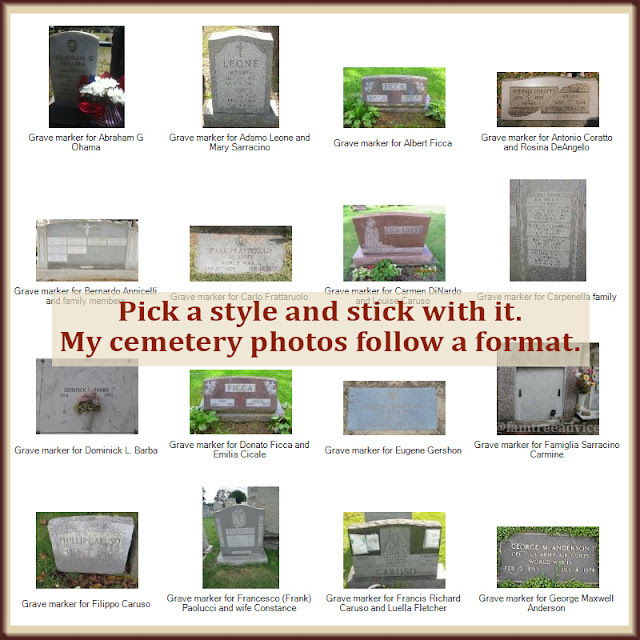 Genealogy has become like another client to me. The tricks I learn with Excel spreadsheets on the job, I now apply to my genealogy work. I take the Photoshop skills I develop while enhancing document images and apply them to my paying clients. And my organization skills are always improving. It seems clear to me these gifts are the reason you find so many helpful amateur genealogists on Facebook paying it forward. People are always ready to help you with a difficult search. Or to translate a birth record. Or to recommend where to go next in your search. 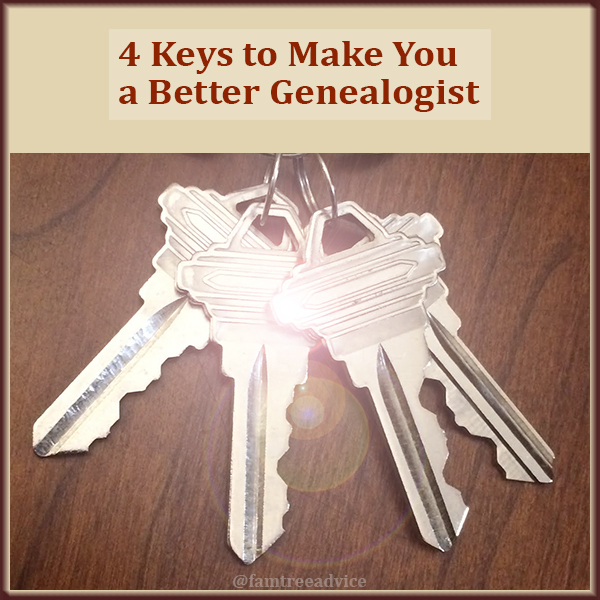 We're ready to help the next genealogist because we're grateful for all our gifts. You think I'm wasting my time with family tree research? You clearly don't see what's going on here. Yesterday I used a set of 1819 marriage records to make a big discovery. An acquaintance I assumed is my relation to me is in fact my 6th cousin. He and I share a set of 5th great grandparents. I know their names, their approximate years of birth, and some of their children's names. But that's all. 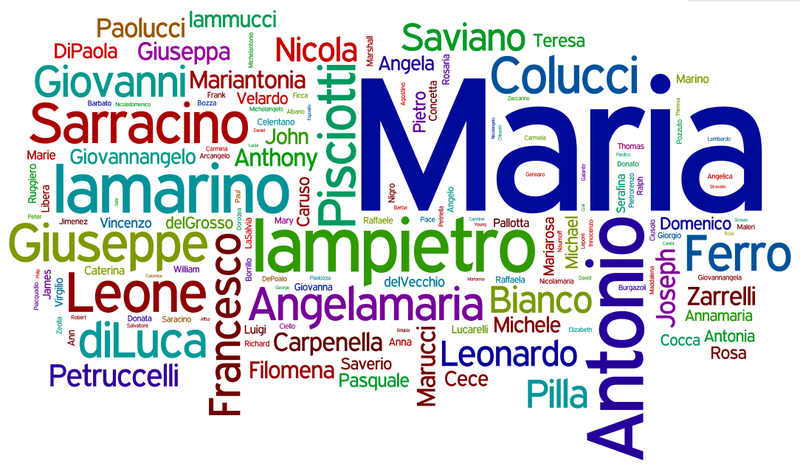 A word cloud of my closest relatives and the frequency of names. My ancestors all came from little hilltop towns in rural Southern Italy. I visited their towns last month and got a better feel for these places. My ancestors lived simple lives that were basically undocumented and unexceptional. That means I'm not going to find a letter from my ancestor to the king. My ancestor wasn't the mayor of the town or instrumental in a revolution. My ancestor's name and exploits weren't in the newspaper. Without the possibility of a direct line of ancestors leading to the King of England, why do I do it? Why do I spend countless hours gathering the documents that tie me to such distant cousins? For me, it's the sheer joy of names. I adore all the names I find in my vast collection of birth, marriage and death records. 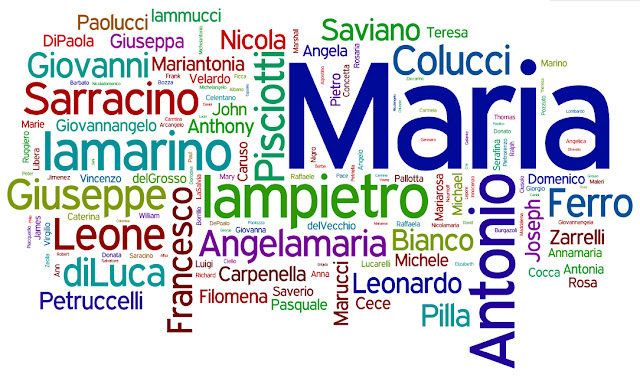 They're repeated over and over because of the Italian tradition of naming children after their grandparents. Although each of my ancestors' towns are close to one another as the crow flies, each town has a core set of surnames. For example, my maiden name barely exists in my grandfather's hometown anymore. But people in the town recognized it and responded to me warmly. It's some of my closest last names that enable me to assume someone is my relative. If their name is Pozzuto, for example, and their ancestors came from the town of Colle Sannita, we've got to be cousins. It's an exciting challenge to try to find that exact relationship. Some purists may look down on me as nothing more than a "name collector". But I love collecting those names. I've learned a little bit about life in my ancestral hometowns in centuries past. I can't expect to find much more. military record told me volumes. My grandfather told us he was a prisoner of war with the Italian Army during World War I. He had to eat rats to survive. Last month I photographed his military record at the archives in his home province. how long he was imprisoned. That's a lot of detail in a few lines on a page. My great grandfather was rumored to be an Episcopal minister. An usual thing in a Roman Catholic country. 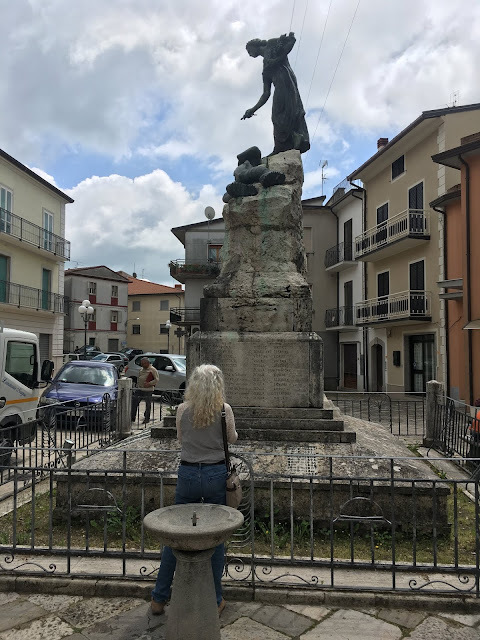 It was only by visiting my cousins in Italy (his granddaughters) that I learned the story. This is not written anywhere. And even my cousins have never seen a photograph of their grandparents. My great grandfather Francesco and his brother-in-law were living and working in the Bronx, New York. It was one of Francesco's many trips to America to earn money. One day he passed by a church in the Bronx. He heard singing and loud voices, and he felt drawn to go inside. This was the type of church where people are so overwhelmed, so deeply moved by the presence of God, they begin speaking in tongues. Francesco brought his new faith back home to Colle Sannita and started his own church. His great grandchildren hold prayer services and follow Francesco's teachings to this day. Those two stories won't get me on TV, but they're all I have so far. Meanwhile, I'm more than happy to indulge my love of Italian names. I collect the siblings of my ancestors and their spouses and children. I love seeing the names get passed down. My 4th great grandfather was Francesco Iamarino. My great grandfather was Francesco Iamarino. My father is Frank Iamarino. So call me a name collector. I am a name collector. These names "are" my ancestral hometowns, and I love them dearly. Genealogy: My escape to a better place and time. I started this blog to go to my happy place. Genealogy gives me endless satisfaction and an escape from everything bad. It's hard to concentrate today, though. There's too much bad news and sadness to ignore. So let's think about why we love genealogy. That's a lot of puzzle pieces to find! Keep in mind your numbers may vary a little if any cousins married. For example, my paternal grandparents were 3rd cousins, so they share a branch of the family tree. the average age at which they married. how many babies they had. how quickly they remarried when their spouse died. the kinds of work they did. how many babies were born out of wedlock. When you fill in your grandparent chart with generations of your ancestors' names, one thing becomes clear. Thousands of people had to marry one specific person and have one specific child for you to be born! Mystery 1: My family always wondered why my father's parents had the same last name. We knew it wasn't a common name. But they never told anyone the reason why. 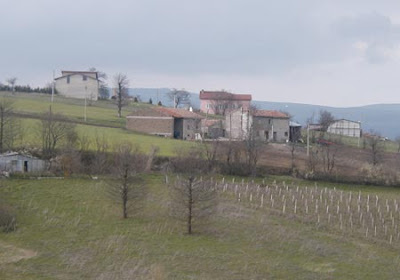 Genealogy research led me to Francesco Iamarino born in 1784 in Italy. He was the 2nd great grandfather to both my grandmother and my grandfather. Mystery 2: At my mother's birth, the doctor asked my grandfather, "What are you naming this baby?" He answered "Mariangela"—his mother's name. The problem is, I found my great grandmother's 1856 birth record, and she was named Marianna. She had an older sister Mariangela who died as a little girl, but she was Marianna. Why didn't my grandfather say "Marianna"? Some more genealogy research led me to that answer, too. My great grandmother had five children. On some of their birth records she is Marianna and on others she is Mariangela. Mariangela may have been her preferred name. My grandfather may never have known his mother's name was actually Marianna. So he proudly named my mother for her: Mariangela. If I could spend all my time doing genealogy, I would. We all deserve happiness. May your family history research bring you as much joy as mine brings me. I know exactly when it happened. When I became that person who cries over a sappy TV commercial. Who can't hold back her own tears when someone else is crying. It was when I lost a close family member to a tragic accident when she was a toddler. This little boy's spirit is imprinted on his siblings, my cousins. I've added thousands of ancestors to my family tree by documenting every family in my ancestors' small Italian hometowns. That means I've entered death records for lots and lots of babies. Each one breaks my heart! This doesn't describe every genealogist. But I suspect you feel an emotional connection to the relatives in your family tree. Think about your favorite genealogy TV shows. Doesn't each one showcase a heart-wrenching connection to previously unknown ancestors? Isn't that genuine emotional connection a part of the human condition? And isn't it the reason we do our family research? I went to a funeral yesterday, and his death was a tragic loss for everyone gathered there. I want to focus on all that went into creating the man I knew. 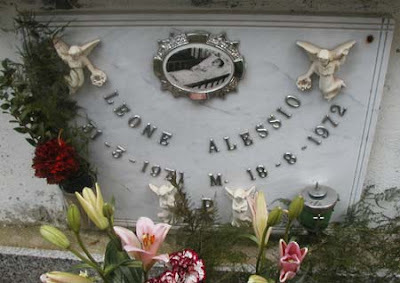 His ancestors, their emigration from Italy, their struggles to raise their families and carry on. 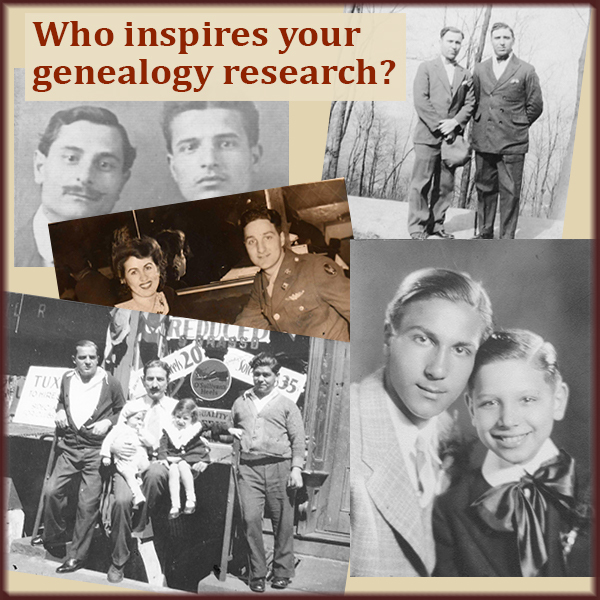 We are, as genealogists, paying tribute to the lives of each one of our ancestors. We're enriching our own spirits as well as those of our cousins. You're discovering all the ancestors who made you exactly the person you are today. You're paying tribute to the people who touch your heart each time you see their names. And if you think that's a waste of time, you don't know what family is.